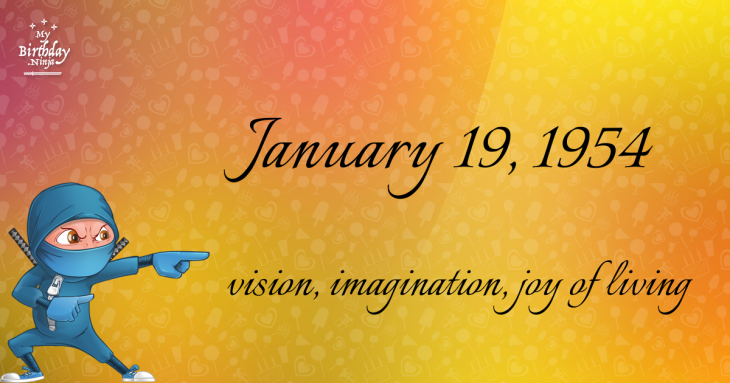 Here are some snazzy birthday facts about 19th of January 1954 that no one tells you about. Don’t wait a minute longer and jump in using the content links below. Average read time of 10 minutes. Enjoy! What day was my birthday Jan 19, 1954? January 19, 1954 was a Tuesday and it was the 19th day of the year 1954. It was the 3rd Tuesday of that year. The next time you can reuse your old 1954 calendar will be in 2021. Both calendars will be exactly the same! This is assuming you are not interested in the dates for Easter and other irregular holidays that are based on a lunisolar calendar. There are 273 days left before your next birthday. You will be 66 years old when that day comes. There have been 23,833 days from the day you were born up to today. If you’ve been sleeping 8 hours daily since birth, then you have slept a total of 7,944 days or 21.75 years. You spent 33% of your life sleeping. Since night and day always follow each other, there were precisely 808 full moons after you were born up to this day. How many of them did you see? The next full moon that you can see will be on May 18 at 21:13:00 GMT – Saturday. Fun stat: Your first one billion seconds (1,000,000,000) happened sometime on September 27, 1985. If a dog named Miickey - a Azawakh breed, was born on the same date as you then it will be 312 dog years old today. A dog’s first human year is equal to 15 dog years. Dogs age differently depending on breed and size. When you reach the age of 6 Miickey will be 42 dog years old. From that point forward a medium-sized dog like Miickey will age 4.5 dog years for every human year. Sten Sture the Younger, the Regent of Sweden, is mortally wounded at the Battle of Bogesund. Peninsular War: After a ten-day siege, Arthur Wellesley, 1st Duke of Wellington, orders British soldiers of the Light and third divisions to storm Ciudad Rodrigo. American Civil War: Georgia joins South Carolina, Florida, Mississippi, and Alabama in seceding from the United States. Student Jan Palach dies after setting himself on fire three days earlier in Prague’s Wenceslas Square to protest about the invasion of Czechoslovakia by the Soviet Union in 1968. His funeral turns into another major protest. The last Volkswagen Beetle made in Germany leaves VW’s plant in Emden. Beetle production in Latin America continues until 2003. The first IBM PC computer virus is released into the wild. A boot sector virus dubbed (c)Brain, it was created by the Farooq Alvi Brothers in Lahore, Pakistan, reportedly to deter piracy of the software they had written. What does my birthday January 19, 1954 mean? 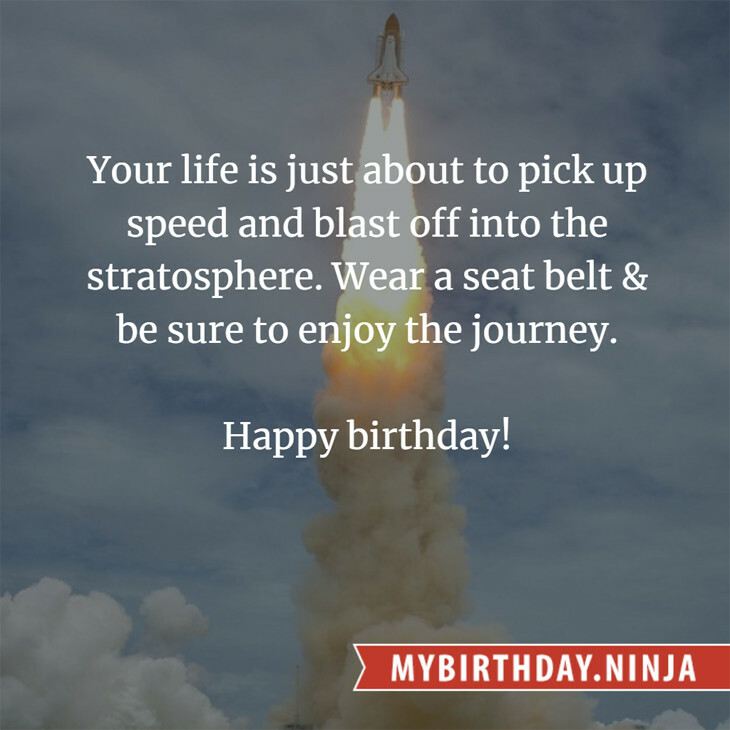 Your birthday numbers 1, 19, and 1954 reveal that your Life Path number is 3. It represents vision, imagination and joy of living. You possess a great talent for creativity and self expression. The following celebrities also have the same life path number: Junior Kimbrough, Merv Griffin, Busy Philipps, Heart Evangelista, Rita Wilson, Alan Napier, Dave Brockie, Kathy Staff, Kate Michael, Patrick Wolf. What is the birthday horoscope for Jan 19, 1954? The Western zodiac or sun sign of a person born on January 19 is Capricorn ♑ (The Sea-goat) – a cardinal sign with Earth as Western element. The ruling planet is Saturn – the planet of discipline. According to the ancient art of Chinese astrology (or Eastern zodiac), Snake is the mythical animal and Water is the Eastern element of a person born on January 19, 1954. Fun fact: The birth flower for 19th January 1954 is Carnation for friendship. What is the Love Match for Jan 19, 1954? When it comes to love and relationship, you are most compatible with a person born on October 11, 1941. You have a Love Match compatibility score of +163. Imagine being in love with your soul mate. On the negative side, you are most incompatible with a person born on July 30, 1935. Your incompatibility score is -190. You’ll be like a cat and a dog on a love-hate relationship. Arf-arf, I want to bite you. Meow-meow, stay away from me! How many babies were born on January 19, 1954? Base on the data published by the United Nations Population Division, an estimated 98,513,524 babies were born throughout the world in the year 1954. The estimated number of babies born on 19th January 1954 is 269,900. That’s equivalent to 187 babies every minute. Try to imagine if all of them are crying at the same time. What is the popular baby name on 19 Jan 1954? Here’s a quick list of all the fun birthday facts about January 19, 1954. Celebrities, famous birthdays, historical events, and past life were excluded. Try another birth date of someone you know or try the birthday of these celebrities: April 29, 1987 – Alicia Morton, American actress and singer; January 8, 1992 – Pamu Pamorada, Filipino actress; June 12, 1948 – Lyn Collins, American singer (d. 2005).